It's almost Christmas and if you don't have social and digital plans in place already then your goose is probably cooked! But for those doing a last minute social scramble, Craig McGill, Digital Strategist at Weber Shandwick is on hand to deliver some handy last minute Christmas tips that might help B2B and B2C get some last minute sales in. And – as it's nearly that time of year – a quick look ahead with some predictions as to what 2014 is going to bring social and digital. 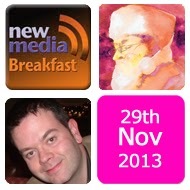 So for last minute Xmas advice or a sneak peak to 2014, the November New Media Breakfast presentation is the place to be. Craig McGill, Weber Shandwick will present the November New Media Breakfast. Craig is one of Scotland’s leading social media consultants; working with companies throughout the UK, many in the whisky industry, he has built an excellent reputation as a social media visionary and practitioner. He is a regular speaker at business networking and training events and we look forward to his insight into one of the great Scottish economic success stories in recent years.